The 10 Best Hot Dog Joints in Iowa! There is something just right about a well-made hot dog. From satisfying flavors, to the delicious toppings, to the perfect atmosphere, all of these elements come together to create the ideal hot dog joint. To find your hot dog fix in the state of Iowa, you don’t have to travel very far, and whichever one of these 10 best hot dog joints in Iowa you do choose, know that your appetite will always be satisfied. Serving the Sioux City public since 1918, the Milwaukee Wiener House is the perfect spot to go for some classic dining options. Complete your meal a bottled soda at the Wiener House, and feel yourself take a step back in time towards when this iconic establishment first opened. While the ambiance has had some remodeling and renovations in recent years, you’re still guaranteed to get the good service and fresh ingredients that has kept this community staple establishment open for almost an entire century. The Flying Wienie of Cedar Rapids has been serving up Chicago-style dogs and friendly service since 1999, and while the world has changed quite a bit since that time, the fresh ingredients and smiles on their faces have remained the same. Whether you opt for mustard and relish or go for some chili cheese, if you are looking for hot dogs made to order, or any of The Flying Wienie’s other delectable menu options, if anything is guaranteed upon visiting this fast, food environment (not too be confused with fast-food) is that your taste buds will be satisfied. Truly a Des Moines staple, Ted’s Coney Island is perhaps best known for its gyros, but if you’re not really in the mood for some house-made tzatziki sauce, then the Chicago-inspired dogs found at Ted’s Coney Island will surely hit the spot. Ted’s is more than just an order-and-go situation though, and with a bright atmosphere and central location on Ingersoll Avenue, Ted’s has blossomed into a community spot where locals and tourists alike flock to get some good food and better company. Nothing quite beats the appeal of getting a hot dog on a street corner from a friendly vendor, and a perfect example of that can be found on the streets of Le Claire with the Iowa-famous Hot Dog Guy. The Hot Dog Guy food cart is the most popular street vendor in Le Claire, partly due to the fact that he is Le Claire’s only street vendor, but mainly because the high-quality sausage he serves has that nostalgic taste of times ago when all you needed to make your day was a fresh dog, some condiments and perhaps a side of chips. Also available for private parties, be sure to check out The Hot Dog Guy’s Facebook page for when and where he’ll be setting up shop next. Located just outside the Figge Art Museum in Davenport, and open from 10 a.m. to 3 p.m. Monday through Friday (weather permitting), there is ample opportunity to catch a bite at Big Dog’s Hot Dogs. Whether you want to keep it simple with mustard and ketchup, or want to add a little more flavor with pickles, onions and tomatoes, Big Dog has you covered. A great taste on the streets of Davenport, if the weather is warm enough, Big Dog’s Hot Dogs will treat you right with that perfect summer taste. Even if you are visiting from out of town, one stop into George’s Hot Dog Shop in Sioux City and you’ll feel like part of the family. Classified as a fast-food shop with friendly service, George’s doesn’t just serve up a welcoming atmosphere, but found on the menu is every variety of hot dog you can imagine. Whether you are looking to coat your dog with layers of chili and cheese, or perhaps you aim the ketchup bottle for more of a traditional approach, George’s is fast becoming the No. 1 shop in Sioux City for all your hot dog cravings. Serving the world-famous Nathan’s Hot Dogs, Bigg Daddy’s of Cedar Rapids has that foot-long fantasy you’re looking for. Whether you like your hot dog boiled, grilled or even deep-fried, Bigg Daddy’s serves it up right with all the fixings you choose to decorate your bun with. 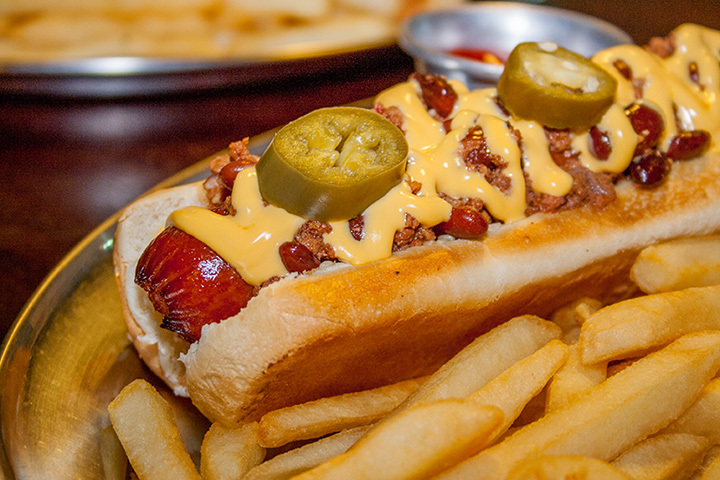 Once you’ve tried their signature hot dogs, be sure to explore the menu for more, including in-house brisket and mouth water daily specials, ensuring your next visit to Big Daddy’s will include a full stomach and a satisfied appetite. For that authentic Chicago hot dog taste in Iowa, look no further than Chicago Dog in Urbandale. With locations both in Des Moines and Urbandale, you’re chances of getting award-winning hot dogs double with Chicago Dog, and whatever location you choose, you’ll be sure to find all the fixings that make your taste buds water. Whether you check it out for lunch, dinner or maybe just a meal between meals, this family-friendly establishment is the place to go for a casual bite and quick service. Open every Sunday as part of the Freight House Farmers Market in Davenport, Timmy’s Chicago Style Hot Dogs has the art of the frankfurter down to a science. With a splash of mustard, a helping of chopped onions, real tomato slices and of course Vienna Beef hot dogs to as its canvass, see for yourself the delicious outcomes produced from fresh ingredients and friendly service at Timmy’s Chicago Style Hot Dogs at the Freight House Farmer’s Market in Davenport. Even though Bob’s Drive Inn in Le Mars likes to keep things simple with their short menu and fast service, don’t expect this hot dog eatery to skip out on any of the fixings that make hot dogs so great. Whether you are looking for a full meal, or perhaps any easy snack as you are exploring the surrounding Le Mars area, Bob’s Drive Inn won’t take up too much of your time to check out and it most definitely won’t leave you hungry needing some more.